Amla Chatpati Masala Candy is a refreshing sour and spicy digestive candy for improving appetite and ease of digestion.It stimulates the digestive juices and helps in the digestive process. It is sour and spicy fun-filled treat.It is a powerful antioxidant and rich in minerals and vitamins. • Wash and fully dry gooseberry with kitchen towel or dry cloth. • Slice the amlas . The thinner the slices,easy to eat. Discard the seeds. • In a bowl take amal slices and toss them well with salt ,black salt,black pepper,dry mango powder,cumin powder . • Keep them aside for 2-3 days in that bowl only. • Every day atleast one time mix the amla slices well with dry spoon. Little bit of water will come out of amla. • Spread out the amla slices on a large plate and put it out in the sun light for a few days, until there is no moisture left in the amlas. 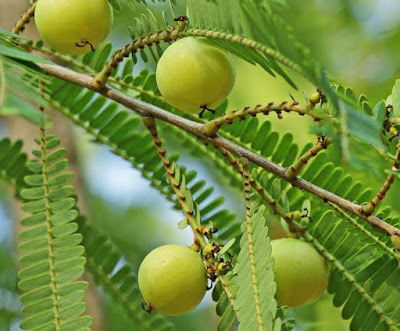 • If sunlight is good then amla will dry within 2 days otherwise it will take 4-5 days to dry. •Once sun-dried, store them in a airtight container or in a dry jar for an ideal on- the- go- snack. 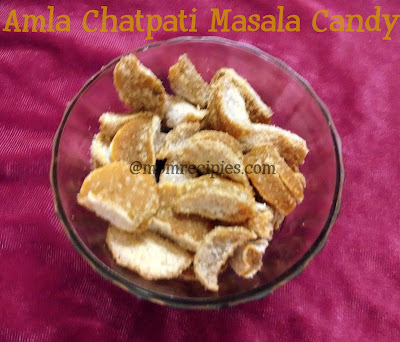 Amla Chatpati Masala Candy is ready to eat and will stay fresh for a year.